Once again I am happy to be playing along in the Free Stamp of the Month Challenge for November thanks to From the Heart. 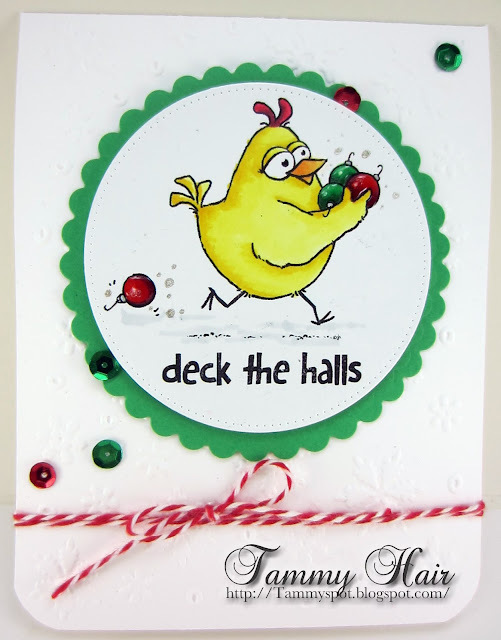 This month's image is Deck the Halls Birdbrain that I've colored with copics. Great addition to my pile of completed cards! Tiz the sesaon to be jolly..this little guy, is just so cute. What a fun image and brings out a big smile. Oh my gosh he's so cute!! What fun little baubles!! LOL!! Hahahaha! Someone looks in a hurry to get the decorating done! What a fun card. Just my type for Christmas. Colorful and cute! Totally FUN christmas card, Tammy. You´ve did a great job with Deck the Halls Birdbrain and i like your CAS layout. Thanks for joining our FREE Stamp of the Month November Challenge @ From the Heart Stamps !! This is me today! I have to get shaking on my Christmas tasks!! I love this delightful card, Tammy! Awesome card as always Tammy! I ned to get cracking soon & get organised! Lol! Love the colours on your cheeky little birdie!